Quick dodge of the clouds yesterday evening to catch Jupiter being photobombed by Europa and Venus approaching half-phase. Note Great Red Spot just starting to appear round the limb. 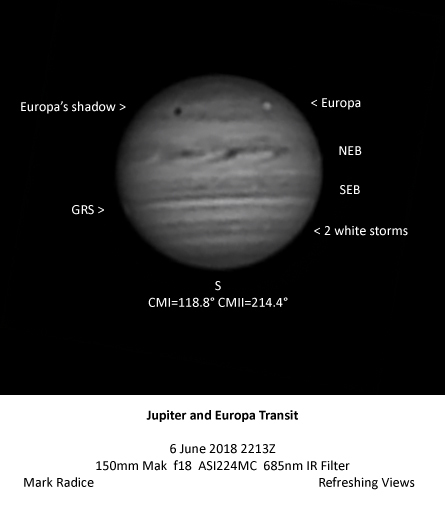 Europa was in transit with a trailing shadow just as the GRS was rotating into view. It is interesting to note the changes in the SEB from last season. It looks like 3 stripes now. Lots of detail in the NEB too – and a few white storms in the south tropical zone. 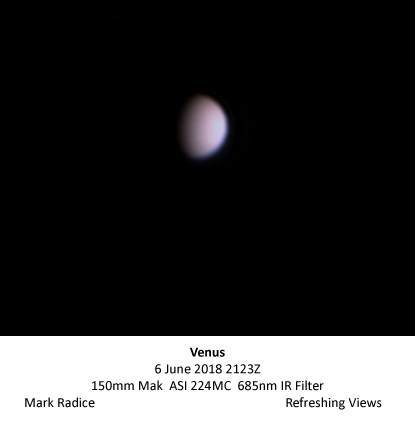 Although it’s rather pleasant to be out in t-shirt and shorts I can’t help but look forward to Jupiter being a bit higher in the winter skies again.